The NETGEAR Nighthawk Tri-Band AX12 12-Stream Wi-Fi 6 Router (RAX200) with 8 streams of 5GHz and 4 streams of 2.4GHz delivers more available bandwidth and less congestion - equivilant to 4x the data capacity over the previous generation of 802.11ac Wi-Fi, also now known as Wi-Fi 5. The Nighthawk Tri-band AX12 sets you up for faster speeds and latest Wi-Fi technology in the foreseeable future as computers, mobile and IoT devices adopt the latest Wi-Fi 6 technology, while continuing to support all of your existing Wi-Fi devices. 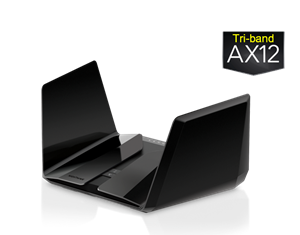 The Nighthawk Tri-band AX12 candeliver more than one Gigabit of throughput to mobile devices that support 160MHz bandwidth. Dynamic QoS - Prioritizes network traffic for uninterrupted video streaming for applications like YouTube®, Net?ix®, & others.